This colorized sub-Angstrom scanning transmission electron microscope image shows individual atomic columns of strontium (green), titanium (blue) and oxygen (red). A simulated image is overlaid showing close agreement between theory and experiment, with the brick and mortar structure clearly visible. Image: Greg Stone/Penn State. Researchers at Penn State and the Molecular Foundry at Lawrence Berkeley National Laboratory are pushing the limits of electron microscopy down to the scale of just tens of picometers, a fraction of the size of a hydrogen atom. The ability to see at this subatomic level is crucial for designing new materials with unprecedented properties, such as materials that transition from metals to semiconductors or that exhibit superconductivity. The use of this novel microscopy technique by the researchers to uncover the first atomic scale evidence for strain-induced ferroelectricity in a layered oxide is now described in a paper in Nature Communications. "This paper is important because it highlights our ability to design new classes of materials that can be tuned, one atomic layer at a time, to get interesting new properties such as high-frequency tunable dielectrics, which are of interest to the semiconductor industry," said first author Greg Stone, a former Penn State post-doctoral scholar now at the US Army Research, Development, and Engineering Center. Designing new materials with potentially useful properties requires a close collaboration between theory, synthesis and characterization. Theory is required to build the mathematical models, synthesis is required to create the material in the lab, and characterization is required to visualize and measure the material's properties and provide feedback to tweak theories and improve synthesis. This study builds on previous theoretical work by co-authors Turan Birol and Craig Fennie of Cornell University and experimental work by co-authors Venkatraman Gopalan of Penn State and Darrell Schlom, formerly at Penn State and now at Cornell, and their students. Gopalan and Nasim Alem, professors of materials science and engineering at Penn State, led the current study. Complex oxides are materials that form by combining a negatively-charged oxygen ion with two positively-charged ions. In this instance, the team examined strontium titanate with a structure called Ruddlesden-Popper (RP), named after the two scientists who discovered it. This structure looks like a brick and mortar wall, with the bricks made of strontium titanate and the thin mortar between the bricks made up of strontium oxide. When the bricks are layered in this fashion, new properties emerge that would not appear in a single brick. 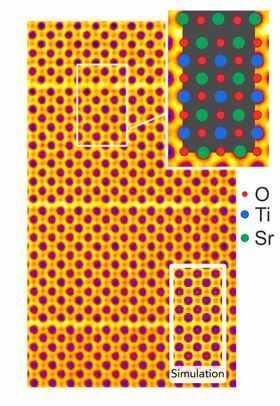 "In the case of RP-strontium titanate, the emergent property is ferroelectricity, which means it has a built-in electrical polarization within its structure," said Gopalan. "But it could be magnetism or metal-insulator transitions or superconductivity, depending on the atoms involved and the layering order of the materials." Because each layer of brick has a weak connection to other layers, the material can have competing states, with one layer polarized in an opposite direction to a neighboring layer. These competing states produce a material that generates a strong response to a small external stimulus such as an electric or magnetic field or temperature. In the case of strontium titanate, there is a large dielectric response, meaning it has the ability to store large amounts of energy, as in a capacitor. Cell phones have many dielectric components that are very small and have to hold a charge. As cell phones transition from 4G networks to 5G, such that they are processing at 5 billion cycles per second, better materials that respond at higher frequencies are crucial. RP-strontium titanate is a material that is definitely superior to current materials. "This work is an excellent example of the materials advances possible when we close the feedback loop between first principles calculations and atomic resolution electron microscopy," said Colin Ophus of the National Center for Electron Microscopy facility at the Molecular Foundry. "The precision of the agreement between theory and experiment is critical to unraveling the subtle differences in structure between competing ferroelectric phases," adds Jim Ciston, also at the Molecular Foundry. "These images of atomic positions are more than pretty pictures of remarkable precision, but contain an enormous amount of quantifiable information about the minute distortions in atomic positions that can lead to surprising properties." Assembly of cell-laden microgels for cartilage tissue engineering.